I Love You More Than Carrots: Stress-Free Packing For Kids :: Hey, That's Pin-tastic! 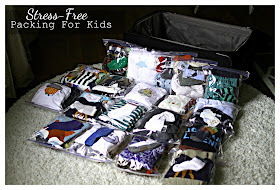 Stress-Free Packing For Kids :: Hey, That's Pin-tastic! If you're anything like me the thought of having to pack for two children two and under for twelve days sounds about as fun as a routine trip to the dentist. I won't even mention that this most recent trip also involved the boys' first airplane ride. 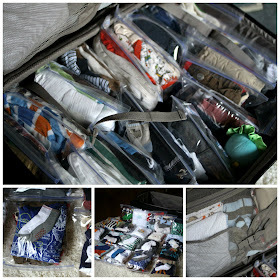 If I'm being honest, the thought alone of having to pack for the boys for twelve days is enough to send me into a full blown panic attack what with the tiny shirts, the elusive baby socks, the umpteen pairs of GAP striped footie pants- I could go on forever! That is, until I discovered the power of the Ziploc (zippie) freezer baggie. Each of these bags is packed with a full day's worth of clothes for each of the boys from a matching shirt and pants with socks down to what they'll be wearing to bed for the night. Since the baby tends to go through more than one outfit during the day, his baggies are packed with two sets of day clothes and two sets of jammies. There are even extra bags packed with additional shirts for the toddler, monogrammed tops, matching sibling tops, extra socks, burp cloths and blankets. Not only does this eliminate rummaging through the otherwise bottom-less pit known as a suitcase each morning, but it also allows your little ones to pick out their own clothes for the day with ease. Carter loves waking up each morning while on vacation and picking out his baggie for the day. With their see-thru plastic sides it makes it so easy to see what's already been put together for the day. Just grab it and go! Doesn't that top picture make your heart sing or is it just me? Imagine the possibilities. When packing for a little girl you could even throw in coordinating accessories, hairbands, tights, etc! It almost makes me wish that they sold larger zippie baggies so that I could fit my own clothes in them! I purchased a box of 30-count Walmart-brand freezer ziploc bags for under $2. Larger items such as bath towels, jackets and our Bitsy Bag were folded and stored in the zippered mesh pocket in the top of the suitcase. Once the zippie bags were all easily packed into the suitcase, I was able to tuck in three pairs of shoes and a couple of the boys' favorite lovies. Doesn't that sound much less daunting than having to carefully fold and stack each item of clothing by itself in the suitcase risking a mess of half-folded clothes upon arriving at your destination? The inspiration for this project came from this post that was linked up with Hey, That's Pin-tastic. Welcome to Week 10 of Hey, That's Pin-tastic! This week I'm coming to you straight from the Best Coast! Er, I mean West Coast! Be sure to link up your posts below and follow the Hey, That's Pin-tastic pin board! My mom did this for the diaper bag for my siblings & me, and I in turn do it for my son's diaper bag. Plus, the soiled clothes then have somewhere to go instead of just there. But, I never even thought of doing it on a bigger scale for packing! We went to San Antonio for almost a week back in February, when my son was 7 months, and his packing was a mess by the second day. This would have been so much easier! So pinning for our trip to San Fran next summer! This is such a great idea. I might even do it for our routine trips home for holidays and whatnot. I wish I could it with my clothes! Love! I will have to try this on our next trip later this year. I'm a terrible packer! Oh yes, that picture makes my heart sing. I love it. I have heard of this idea and I know I will do it when we go on vacation with Violet. We're taking at least four trips in December. I am SO doing this. THANK YOU. Now, I need to go stock up on freezer bags. I'm wondering what the TSA agent thought when they opened up your suitcase. This is amazing!! I spent way too long reorganizing our suicase last weekend. this would have saved me so much time! i will definitely be doing this going forward! They do sell bigger ziplocs! I definitely will have to do this when we are traveling with more than 1 kid if I get knocked up. Right now with 1 kiddo I can rummage! Yes it is the best coast :). I love this! Wouldn't it be kinda cool if they sold reusable bags like this that you can wash?! I'll have to check into it! You actually can pack your clothes like this. They're a little harder to find, but 2 gallon ziploc bags will hold an adult outfit. Our church used to encourage us to Pam this way for mission trips to Mexico to help prevent little creature from stowing away in our bags since the floors where we stayed were dirt. It is so easy to pack up at the end of a trip if you do this. And so easy to rifle through your stuff if you don't have a place to unpack along the way. Added bonus-if you squeeze all of the air out of the bags, you can pack so much more stuff! And you can reuse the bags over and over. Love this idea buy doesn't it take up more room in the case? I'm travelling in 4 weeks with 2 adults and 3 kids aged 8, 4 and 2. I will be traveling with my 3 month old next month to visit family for little over a month and I'm already going crazy thinking of what I have to pack and what I will have to buy a duplicate of for the trip. I did the same for Christmas in Italy! Also because I would have left my 3 months old with nonna1 and nonna2, so they had no thinking to do, just grab a zip bag and dress her!